Did you know that it was a visionary Finn who was one of the main forces behind global drone revolution? Another Finn made Thailand famous in the chess world by creating the Bangkok Chess Club Open Tournament. Vision Finland 2019 is a production of Thai-Finnish Chamber of Commerce (TFCC) and presents Finnish companies and personalities who have brought their visions and innovations to the Kingdom. Southeast Asia with 600M+ people is a vast growing market area. Finnish innovations and knowhow are greatly appreciated in this market and it is the responsibility of the Finncham organization and Team Finland organization to deliver more information of SEA market directly to the Finnish companies all over Finland. 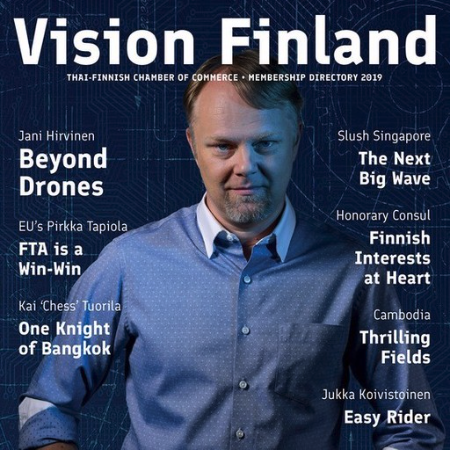 We hope this Vision Finland 2019 digital magazine finds all members within the regional chambers in Finland and the rest of Finnish and international readers. When thinking of business opportunities in Thailand TFCC and Team Finland are here to serve you.